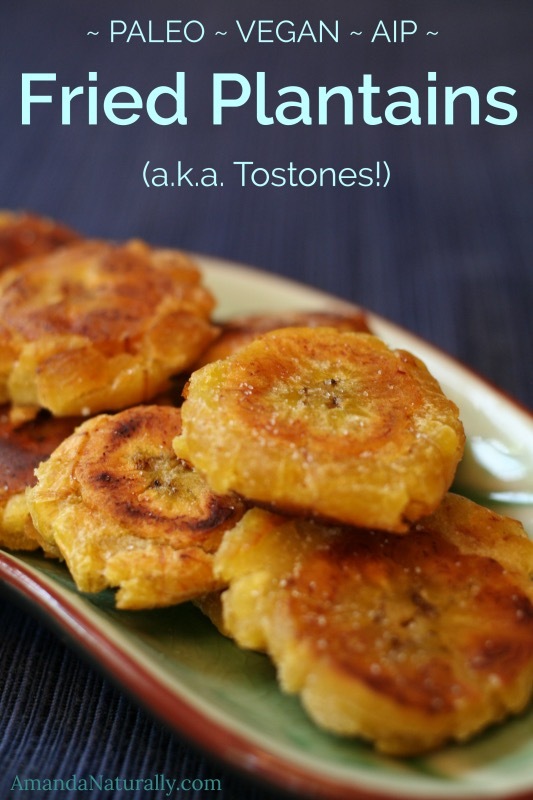 Oh plantains – how I love thee! They are incredibly versatile and can be used to make everything from biscuits and pancakes, to tortillas and nachos. Green plantains are savoury and a great alternative to potatoes. 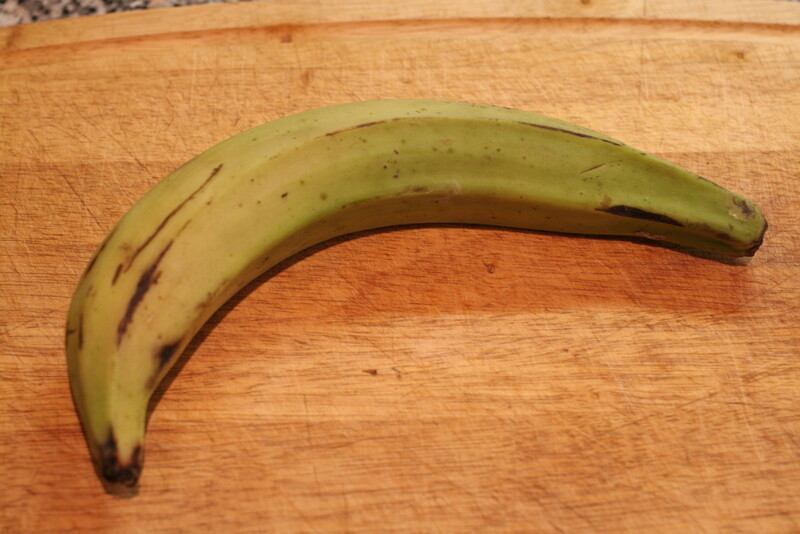 Ripe plantains (yellow, or yellow with brown spots) are super sweet and great for making batters. They last forever in your kitchen (well as long as you don’t eat them) because you can use them at all stages of their ripeness. Seriously, we’re talking weeks before they go bad! They cook up very quickly. Most people who have switched over to a real-food diet will agree with me when I say whole-food starches take a long time to prep! Sweet potatoes and squash take almost an hour in the oven, and sometimes (ok most times) I don’t have that kind of time! 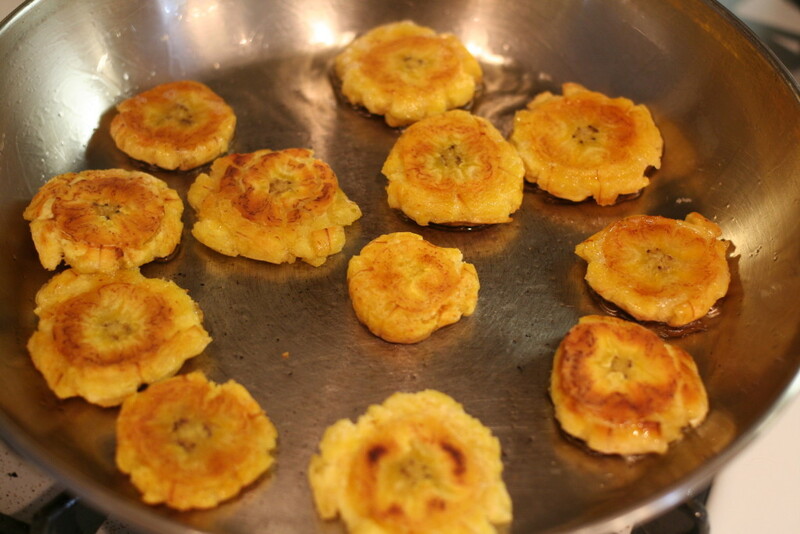 Fried plantains, as you’ll see in the recipe below, take 10 minutes. They are a very neutral starch, so unless you have a banana allergy, they are usually safe for most people. They are very nutrient dense (as opposed to grains and flours) and are full of the good kind of starch that feeds your beneficial gut bacteria. They do have one major downside – they’re definitely not local to where I live. So not only can that make them challenging to locate (note: Asian markets and ethnic grocery stores always have them), but it also means they have a high environmental footprint. I try to eat mostly local and seasonal – meat from local farmers, vegetables from a local CSA – but plantains, bananas and coconut are the one exception. Driving a Prius makes me feel a bit better about that! Plantains can be a little intimidating the first time you make them, so my goal with this post is to show you how simple they are. 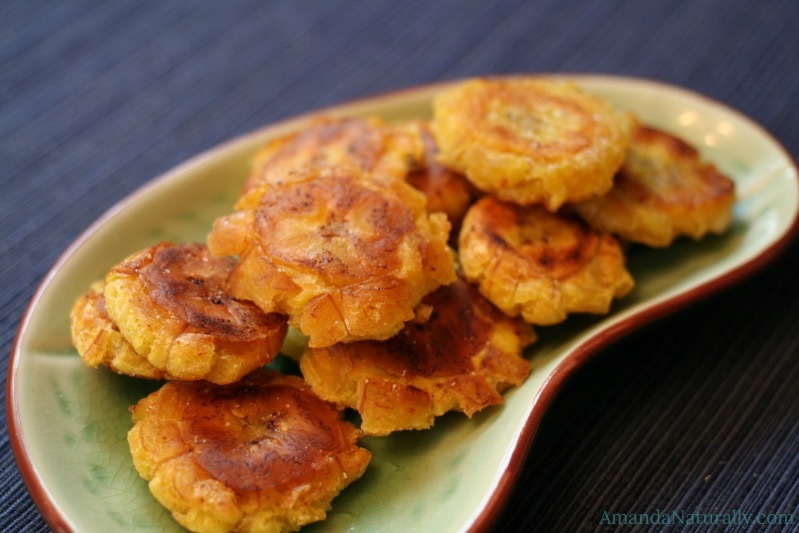 This recipe is for fried green plantains, also called tostones or patacones, depending on where you’re from! These guys are reminiscent of a french fry or potato wedge. You can follow the exact same recipe for ripe plantains, but you won’t need to smash them halfway. Also they’ll be very sweet. Which ripeness you choose to fry up depends on the meal you’re preparing, your personal preference and if you have any plantains left that were allowed to ripen! 1. 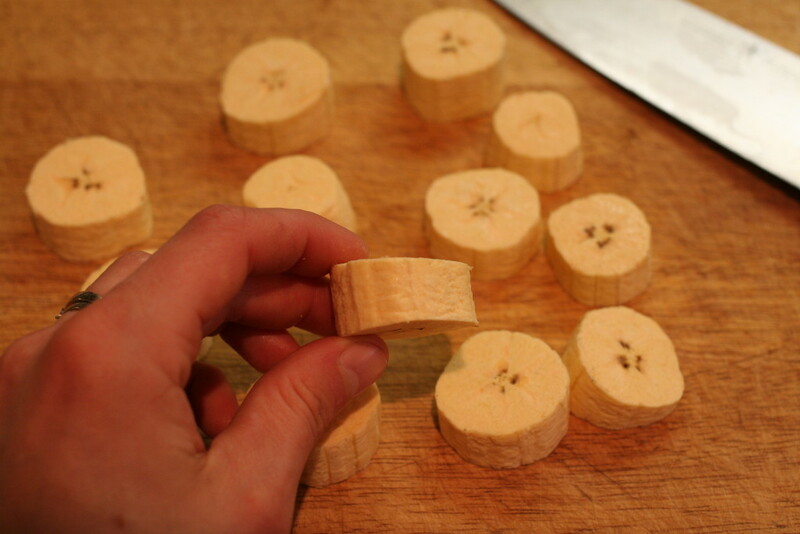 Slice off the ends of your plantain and cut into 3 or 4 chunks, to make the next steps easier. 2. 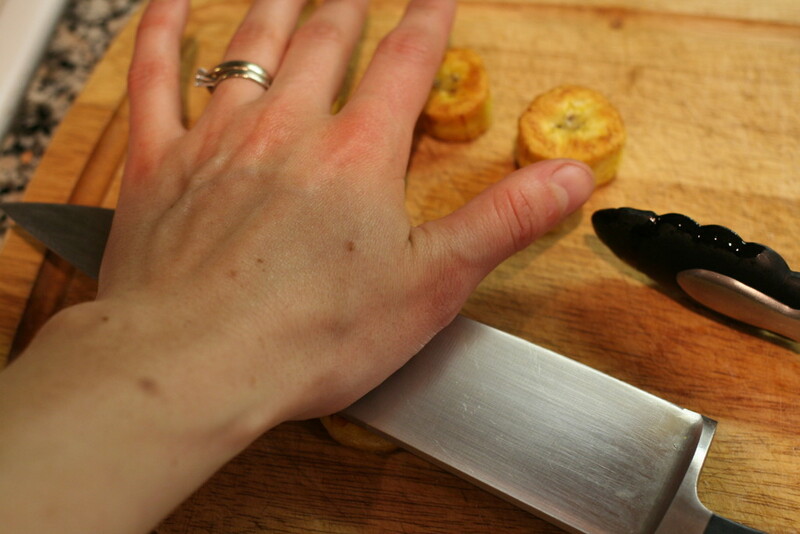 Score the skin of the plantain, being careful not to cut the flesh. Use your knife edge or fingernails to peel off the skin. It’s a lot tougher than a banana, but the flesh isn’t as delicate so no need to worry about bruising the plantain! 3. 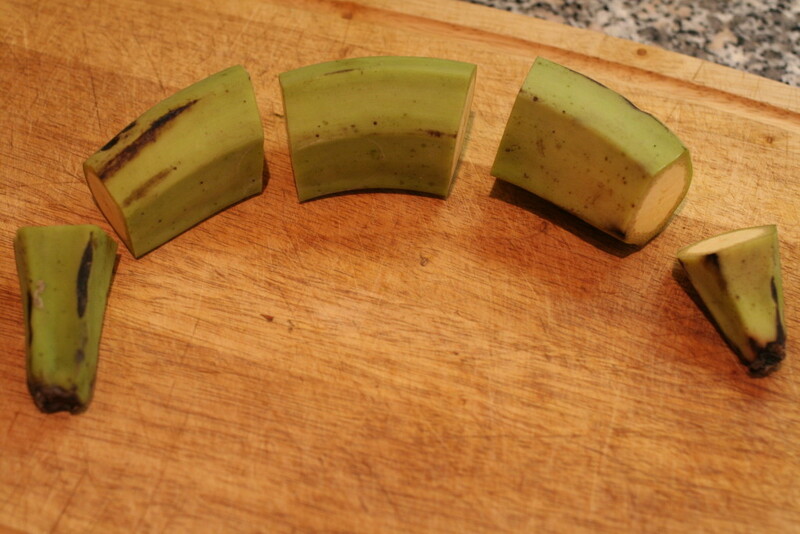 Once the skin is removed, slice the plantains into about 1-2 cm discs. 4. Heat a decent amount of fat in a frying pan over medium. I love using coconut oil for frying plantains because it really compliments the flavour of the plantain, but you can use any saturated fat (ghee, lard, bacon grease, tallow). You want the melted fat to be a few millimetres deep and covering the entire pan. 5. Place the plantains in the hot oil and cook for 3-4 minutes. You will notice the bottom turning golden brown. Keep the burner at medium or less, you want the whole bottom half of the plantain to cook through as it turns golden brown. If they are cooking too fast, turn down the heat. 6. Flip the plantains and cook another 3-4 minutes on the other side. 7. Once they’re golden on both sides and cooked through (you shouldn’t see any raw plantain in the middle), remove a few at a time and smash them! 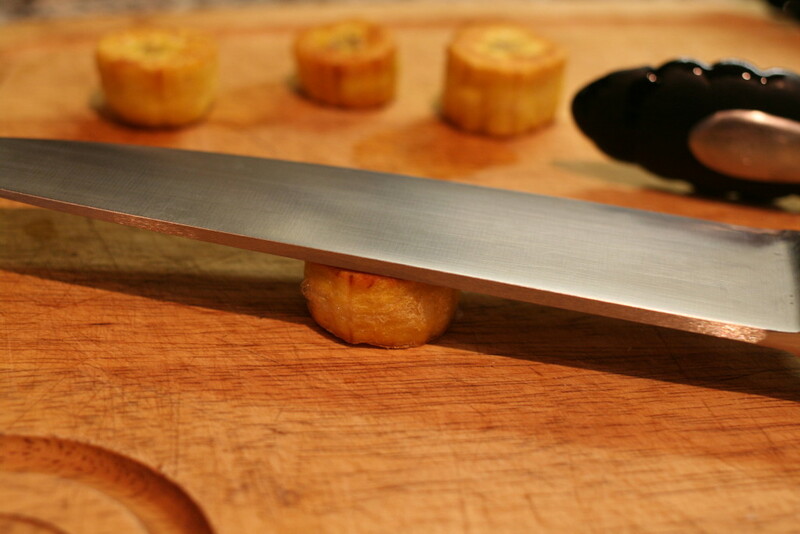 Take a chef’s knife or a glass cup and gently and evenly press down on the plantain disc until it flattens. 8. As you smash the plantains, return them to the frying pan and continue until they’re all flat. Fry for 1-2 more minutes on each side, adding extra oil if you need. 9. Season liberally with sea salt and serve! pretty much anything because they rock. So tell me, what’s your favourite way to use plantains? Never used them before? Give it a go and report back! A simple, nourishing starch free that cooks up in only 10 minutes and is sure to please the whole family! 1. Slice the ends off of the plantain, and cut into 3 or 4 chunks. 2. 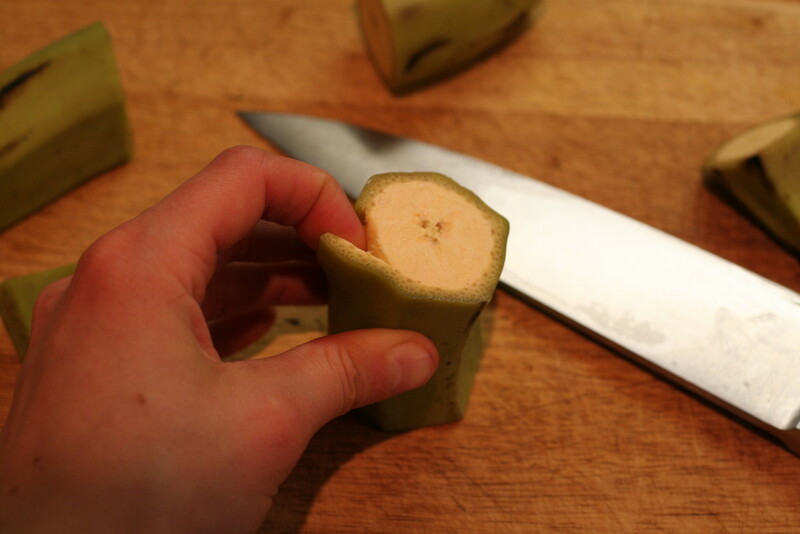 Score the skin of the plantain, being careful not to cut the flesh. Use your knife edge or fingernails to peel off the skin. 3. 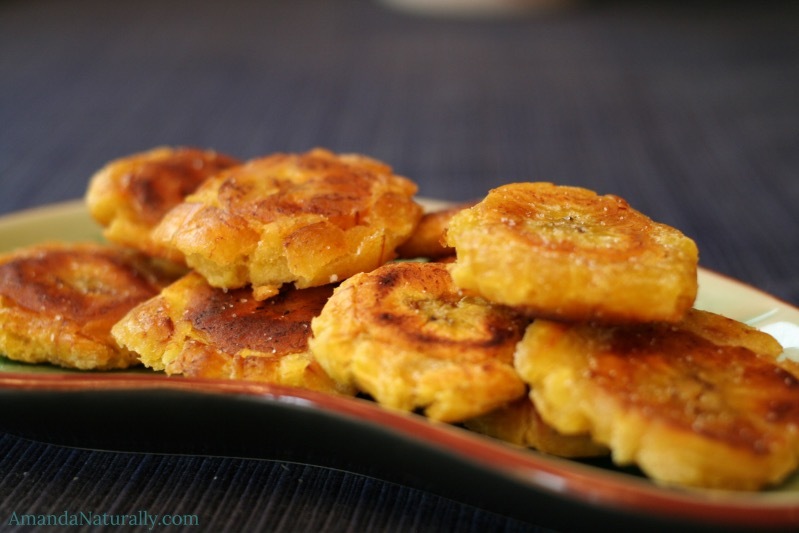 Slice the plantains into about 1-2 cm discs. 4. Heat a liberal amount of fat in a frying pan over medium. 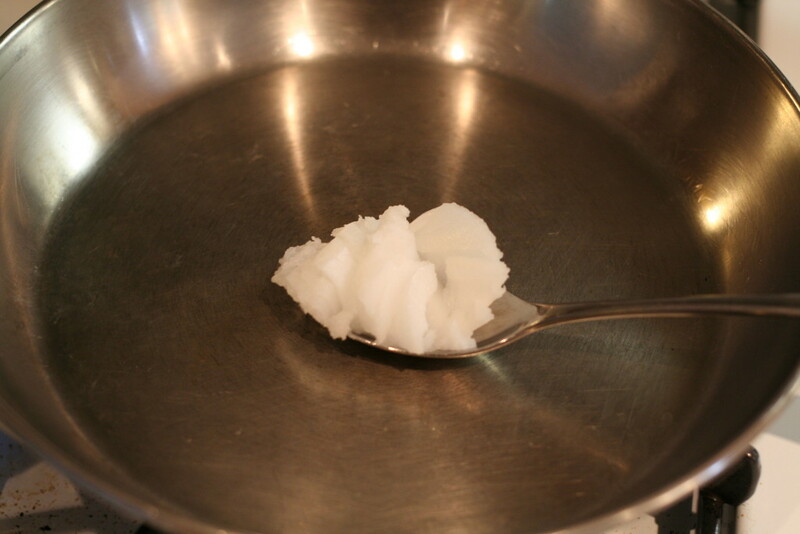 Melted fat should be a few millimetres deep and covering the entire pan. 5. 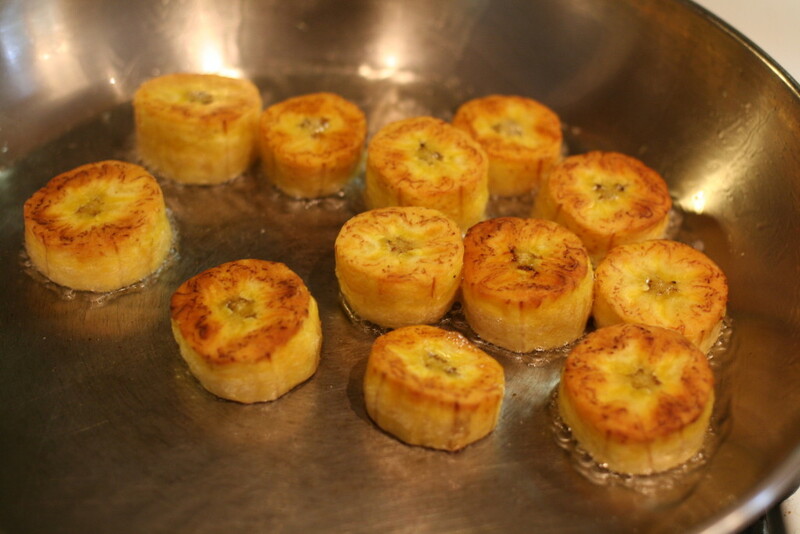 Place the plantains in the hot oil and cook for 3-4 minutes, until the bottom turns golden brown. 7. Once they're golden on both sides and cooked through (no raw plantain in the middle), remove a few at a time and smash them! 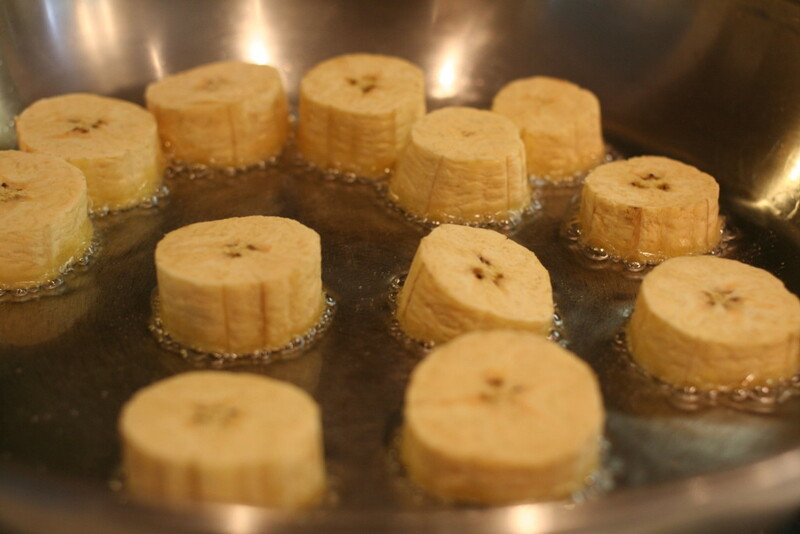 Take a chef's knife or a glass cup and gently and evenly press down on the plantain disc until it flattens. 8. As you smash the plantains, return them to the frying pan and continue until they're all flat. Fry for 1-2 more minutes on each side, adding extra oil if you need. 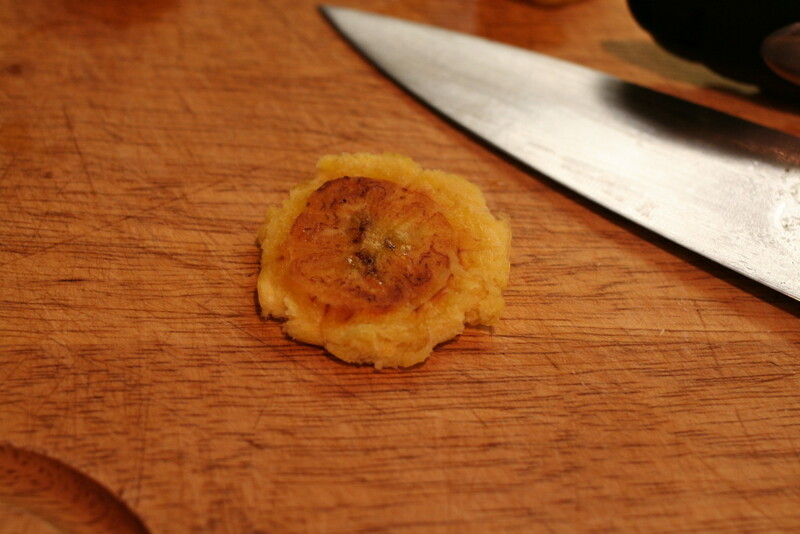 If you are using ripe plantains (which are just as awesome, but quite sweet), you do not need to smash them. Simply cook until golden brown on the first side, flip and cook to golden on the second side. Season with sea salt and serve! 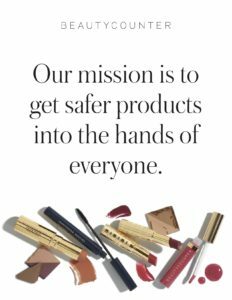 I am loving your website. I stumbled across it as I was looking for a crock-pot chicken stew recipe (that didn’t include canned soup). I love the idea of clean eating and know that even when I just cut down on the highly processed foods I feel significantly better. But I tend to end up falling back into old habits because it is what I am used to, so it is “easy”. 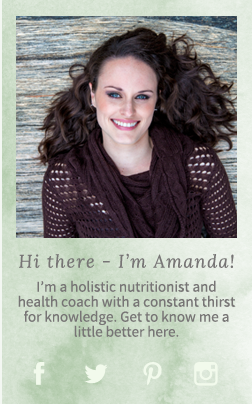 I think your site will be very helpful in making me try some new things that will be so much healthier!